The ancient city of Troy, located south of the Dardanelles in Turkey's northwestern Çanakkale province, hosted 531,650 visitors in 2018, breaking the record for the last decade, local authorities announced Monday. 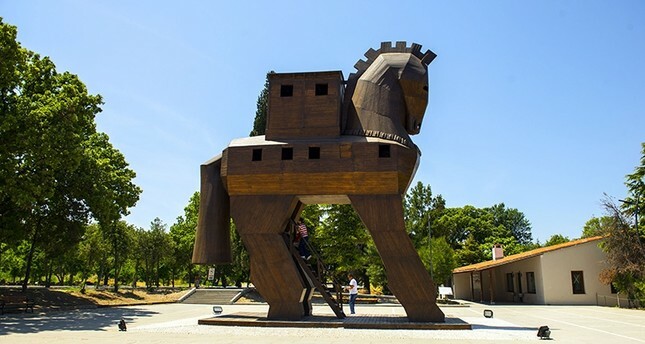 The ancient city has attracted special attention in 2018 – declared as "The Year of Troy" by Turkey's Culture and Tourism Ministry to celebrate the 20th anniversary of Troy being added to UNESCO's World Heritage List – with activities organized around the world to honor the site's historical significance. Provincial Culture and Tourism Director Kemal Dokuz told reporters that the city of Troy is one of Turkey's most important destinations, and the average annual number of visitors has increased from 300,000 to over 500,000 since 2008. This year's 531,650 visitors marks "the highest number of visitors in the last 10 years," Dokuz added. "Apart from this, the archaeological site of Assos and Apollon Smintheus also attracted tourists," Dokuz said, referring to two other historical sites located near the city of Troy in Çanakkale province. Located on the mounds of Hisarlık, overlooking the Turkish Aegean coastal plain, the 4,000-year-old ancient city of Troy is one of the most famous archeological sites in the world. The historic setting of the Greek Trojan War, in which Spartan and Achaean warriors from Greece besieged the city in 13th century B.C., was immortalized by the Greek poet Homer in his epic poem Illiad.